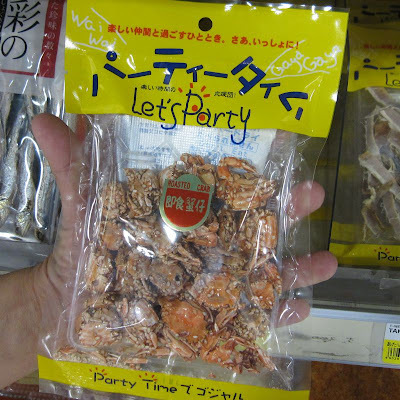 Let's Party with Dried Crabs! Found this package of dried, roasted baby crabs, with sesame seeds at a japanese grocery store in San Diego last Wednesday. I thought it was cute with the "Let's Party" call-to action. No, I didn't try it. Tried these in a small shop in Toronto's Chinatown Center. Started surprisingly sweet, but went horribly horribly wrong after the crunching began. Tasted like fish-flavored sand. Tasted, well, like you might imagine eating a tiny dried crab would taste. I love it!! Don't know if my being Asian made me more accustomed to the strange test, but it was certainly tasty. I've tried them too in Toronto. They tasted pretty good, but shells got stuff in my teeth. Yuck!